So first outfit post of 2012! Eeep! This is actually what I wore on Saturday but decided to hold it off until today when people would actually be online and reading blogs! I adore this shirt from Romwe, the colour is just spot on! Its annoying though as the shirt itself is pretty terrible quality, Its made from quite thin cotton, and I cant see it lasting too long, but for now it will do.I really like how the grey tweed contrasts with it too to give some texture! In between playing Bejewelled today I've literally done nothing of note. Been catching up on JWLRY orders and trying to make sense of my tip of a bedroom. Planned a London trip for later in the week (probably Friday) as Im really having withdrawal symptoms, I just love being there. Living there will probably be my downfall, but its all good! The hot pink is super cute on you, doll! I spent last weekend there, and the atmosphere is just buzzing all the time! It's worth living there just for the incredible shopping! I love what you do with your outfits, very creative. love this outfit! i really liked. hope you are having a good start of the year! The colour of that pink is lovely! Looks like a really nice texture too, pity about the quality. You look amazing in this colour! great combination! black with pink! I love it! blessings in this new year! Hello!!! You are the only blog i have bookmarked as favorite on my browser! Go on everyday to see your outfits. Being as popular as you are on here, i love the fact you actually wear items of clothing again on different outfits! pink is a colour you should wear all the time! i do like your shirt, just because its different. and you can't beat a bit of bubblegum pink this time of year! happy new year! That pink is lovely! Also I have wanted porchester square forever. i just wished Sephora had Nails Inc in store vs. just online. that pop of pink looks wonderful! Seeing your shoes is amazing, love knowing what shoes you combine with outfits! That pink suits you so much! 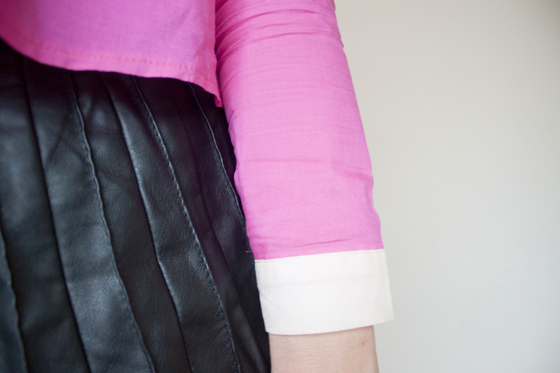 Lovely outfit - loving the bright pink and black leather skirt, great combination and HAPPY NEW YEAR! Beautiful outfit! Pink really suits you, and I love how much it stands out within the grey and black. such a cute outfit! the pink shirts suits you so well.. The pink looks so lovely on you! Lovely look. Love the coat too. Great look. love the pink jumper with a super edgy skirt! looks fabulous!! I seen this skirt in primark when it first came out and stupid me didn't buy it! I really wish I had cause it goes with pretty much anything. I love the top too! I have just started buying from romwe as I was a bit nervous just incase they charged for the p&p when it came here. Just spotted a leather skirt like this in Oasis, will most defo be purchasing. Love the pink, you suit a splash of colour! love the look! have fun in London! Pink looks really nice on you, suits you really well! I love London so much, cant wait to go back this Easter. It's so far away from me :( but one day I will live there! I have been loving following your blog for maybe nearing a year now and have just started my own. I was wondering if you would kindly take a quick peep at mine and just give me some hints and tips (mine is soooo basic at the momment i need to work on it loads! )I really admire how you post so often but with more and more interesting content each day!